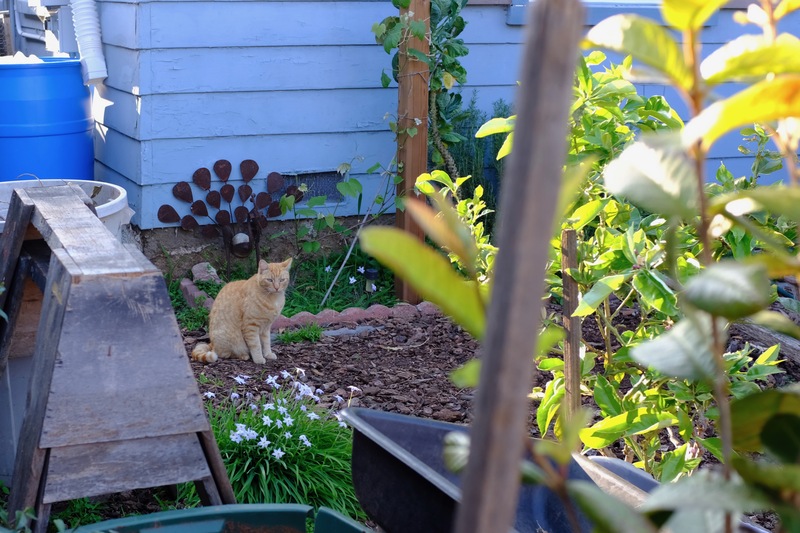 Late yesterday afternoon, as I walked home from Trader Joe’s, I sighted a short-haired tabby in the same yard where Sebastian slept on the Ides of March. 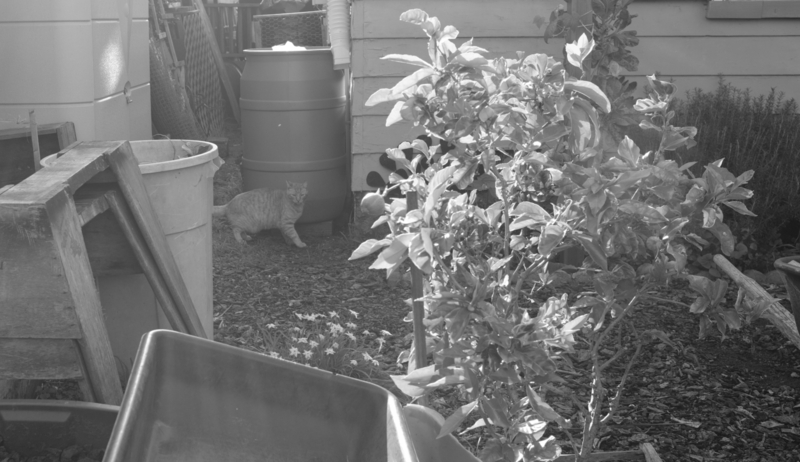 The cat came up a side alley, and I worried he might skitter away. So I got off a quick shot, forgetting that the Fujifilm X100F was set to Acros film simulation. I desperately changed to Velvia and auto-everything. Problem: The sun shone sharply over the animal to the camera. Rays are visible in the first shots. The cropped Featured Image is better-balanced from my getting down lower to the sidewalk, my using the left hand as make-shift hood, and the kitty moving to where the house blocked glare. Vitals for the color pic: f/3.6, ISO 200, 1/125 sec, 23mm. Black and white (which is below the fold): f/5, ISO 200, 1/125 sec, 23mm. The sun situation actually adds character to the B&W photo. If not for the plastic containers, the portrait could be from days gone-by. Time taken: 5:37 p.m. PDT and a minute later for the color capture. Got to say, moseying about the neighborhood: In the nearly 10 years living in San Diego, I have never seen Spring with such abundant citrus—mostly lemons and oranges—growing in dozens (and dozens) of yards. There is so much fruit, some residents hang bags of the stuff on fences to share. I don’t recall much of that behavior in past years. Update: I later spoke with the kitty’s owner. His name is Booger. Update Nov. 4, 2017: Booger is gone. 🙁 Someone posted on NextDoor: “I’m so sorry to report that there is a cat down on the 163 North ramp off of Washington. It looks like an orange striped cat. I’m so very sorry”. 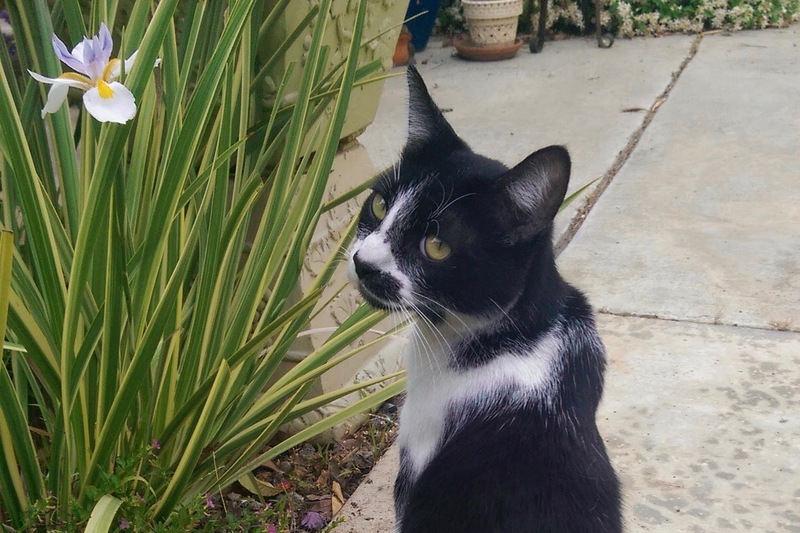 His owner later responded, with photo alongside yard mate Sebastian: “It was our cat Booger💔We got him and took him home. He was beloved by many who walked by our house. We are very sad”. Directly across from Booger’s yard is a perpendicular alley that runs straight to the 163 ramp. Other feline friends from this series: Scruffy, Roly Poly, Woo, Skull, Biscuit, The Colonel, White, Chipper, Frisky, Stretch, Needy, Farfisa, Mates, Hunter, Pee-Pee, Blue, Blue Too, Bonded Pair, Patience, Fess, Jumper, Frenemy, Looker, Cozy, Scout, Lurks, Skit, Mini, Betty, Black and White, Stalker, Bell, Chill, Sammy, Scratch, Poser, Star, Grey and White, Watcher, Herman, Comet, Roman, Willow, Chub, Nimbus, Watson, Lilo, Kit, Pepe, Twilight, Sebastian, and Spot. Would be my pleasure. You live in the neighborhood? Breaks my heart about Booger.